Chris Nickson tells us about the Leeds Library which celebrates its 250th birthday this year. A real gem in the heart of the city. For anything to last for 250 years in Leeds is little short of a miracle. This city is hardly kind and respectful of its history. For it to last that long and not be known to most of the people who live here – even those who’ve spent their entire lives in Leeds – speaks volumes about the way we value our own past. 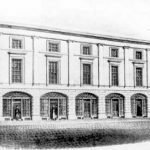 2018 marks 250 years since the Leeds Library, the oldest surviving proprietary subscription library in the British Isles, was founded. 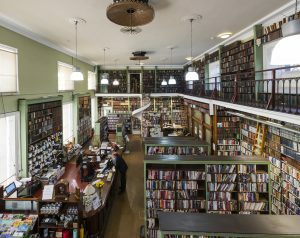 It’s stood on Commercial Street since 1808, when the street first opened, but it was born just a couple of hundred yards away on Kirkgate in 1768, when 104 members each pledged a guinea and paid five shillings annually to be members – long before the existence of a public library. The library was situated above Ogle’s bookshop, very close to the current site of Superdrug, and originally had 503 books, a handsome collection for the time. It moved to a larger building in 1781, the Rotation Office, also on Kirkgate. By then, Ogle the bookseller had died, and his married daughter, Mary Robinson, had taken over the business with her husband, also a bookseller, moving their shop to the Rotation Office, where everyone remained until 1808. 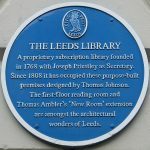 By then, Leeds Library had purchased land on the new development of Commercial Street, and architect Thomas Johnson designed the building that still stands today. Confusingly, at least for today, Commercial Street originally only ran from Albion Street to Lands Lane. When buildings were demolished to connect it to Briggate, the new short street was named Bond Street. Now, of course, Commercial Street runs from Briggate to Albion Street, and beyond that it becomes Bond Street. Of course it makes sense. Mrs. Robinson’s bookshop moved yet again to be on the ground floor of the new library, and she also became librarian. The new premises were airy, with excellent light from the windows, and large enough to hold a dance in the 1850s. And that’s more or less how it’s remained ever since, with much of the stock hidden away in the basement. There are tales of ghosts (see Frances Brody’s Death of an Avid Reader), and now one room holds the library of the Thoresby Society. But at heart, little has changed in a couple of centuries. Even with a blue plaque outside, it’s easy to miss the place. You need to look up to see the lettering. But step inside – there are regular tours – and you’ll see one of the loveliest slices of Leeds history that still exists. Just be careful sitting on some of the old chairs; there are still a few originals from 1808, when they cost 10 shillings (50p) each. Break one and you might be paying a great deal more! You could take a cake there to celebrate its birthday, of course. But even better, join. The cost breaks down to a couple of pennies more than a coffee a week. It’s a place where you can sit (there are comfy chairs, too, which are far less delicate), tea, coffee, biscuits and friendly staff. And books, thousands of them, along with CDs and DVDs to borrow. Best of all, becoming a member makes you part of the continuum of the history of Leeds. And that’s priceless. 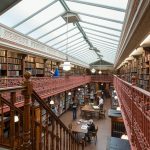 You can find out more about the Leeds Library and its 250th celebrations here. You can pop in for a visit any Thursday between 5pm-7pm and there are regular tours which you just need to book onto. It’s a great event venue too. The Big Bookend has had many author book launches and events there over the last few years – Frances Brody, Chris Nickson, Candace Robb, June Taylor and Becky Cherriman to name a few. Chris Nickson is the author of several historical crime novels set in Leeds. The Tin God is the long awaited sixth novel in the Tom Harper series. As polling day approaches and the attacks increase in menace and intensity, Harper knows he’s in a race against time to uncover the culprit before more deaths follow. With the lives of his wife and daughter at risk, the political becomes cruelly personal. 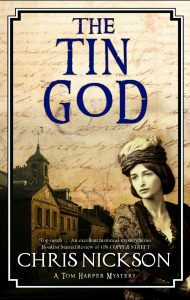 The Tin God is published on 29 March and can be pre-ordered here. It will be launched at a free event at 1pm on 5 May at Leeds Central Library as part of a new exhibition, The Vote Before The Vote. More information to follow. 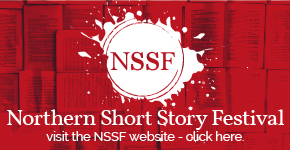 Next story #foundfiction Launch. A Guerrilla Publishing Experiment that Connects Readers and Writers Across the World.